A: Can I! Regular readers of Ask Chris might recalll that it was only a couple of weeks ago that I, along with artist Erica Henderson, got into a discussion of what makes a great "iconic" superhero costume. You can flip back through that one if you'd like, but the short version is that the best costumes in comics tend to be simple and well-defined, getting across a lot of information with a very streamlined look. Generally speaking, the more unnecessary gimmicks you add to a suit, the more distracting it gets, and the less it says about the character, and I think that holds true across the board when it comes to superheroes. But then you get to Judge Dredd, and all those rules go flying straight into the Iso-Cubes, where they're locked up and never, ever let out. Seriously, look at that suit. It's nothing but unnecessary gimmicks. There's nothing streamlined about it at all -- it's bulky, and covered with details that you can't really skip over because, again, the entire costume is all about those details. And yet, it's top five costumes in comics history, easily. Seriously. I love Judge Dredd's costume so much, and when you get right down to it, what it really comes down to is context. Judge Dredd exists in the world of Thrillpower, the far-off future year of 2099 AD, in a society where every single thing has become monstrously overwhelming. Just the very idea of Mega City One, this towering post-nuclear metropolis that's built on overcrowding and stuffing as many people into the only tiny space that can actually support life? That's the core idea of Judge Dredd, and when Pat Mills, John Wagner and Carlos Ezquerra created him, they made sure to weave that into the fabric of those stories. There's a good reason that one of the first ideas that comes up in a Judge Dredd story, once they've established this massive, teeming, crushing society where the fascists are the good guys, is the "futsies," people suffering from "future shock" who just snap under the pressure of living there. Life in the future is just too much for people. Which brings us back to the idea of the costume. When I talked about the "iconic" suits and the value of simplicity, the thing that I kept coming back to the idea of getting the most information across as quickly and efficiently as you can. You take one look at Superman, and you can guess what his deal is. Big, strong, flying guy dressed like a combination of a circus strongman and a police officer with a big badge right there on his chest. Batman, you've got the bat-winged cape and the ears that look like devil horns, done up in all the colors of the night, but almost always posed like a stalwart hero. Spider-Man... well, Spider-Man has a picture of a spider right there on his chest. That one's pretty simple. There's more to the characters, obviously, but those basic ideas are things you can get across with a glance. So take a glance at Judge Dredd. The one thing you can get just by looking at that dude? He has a lot going on. The costume is blindingly ornate, almost overwhelming in just how much there is to it -- you can't really take it in all at once, and when you throw in the fact that he's riding on a motorcycle with five headlights, four exhaust pipes, two machine guns and a Crash Bomber stuck to it, it's ridiculous. There's just too much. Which is, at a single glance, the perfect representation of Dredd and his world. That's one of the things that makes it so brilliant, but the rest of it just comes from how well designed all those elements are. Each element of it is just extrapolated to this wildly over-the-top conclusion based on something that exists. My single favorite part of it are the epaulets on Dredd's shoulders -- instead of a shoulder patch with an eagle embroidered on it like you might see on a cop today, Dredd's design just takes that simple element and makes it bigger and bigger and bigger until he's literally wearing a statue of an eagle on his shoulder, which itself becomes treated super-seriously by the characters as a mark of his rank. And since the Eagle takes so much room, well, he doesn't have the American flag patch that you see on policemen and soldiers, so that migrates down to his belt, where it's incorporated into yet another gigantic eagle. And while we're on the subject of the belt, since crime in Mega City one is so out of control, he has to have a belt that's overstuffed with crime-fighting equipment, putting even the bulkiest real world policeman's utility belt to shame. It's got so much going on that he doesn't even have room for his gun. He has to keep that down in his boots. And then there's the badge, which is just a thing of beauty. From an iconographic standpoint, Dredd's badge is right up there with the Bat-Signal and the Superman shield, but like everything else, it's five steps further over the top. It's the third eagle on the costume (Judge Dredd is set in America, I don't know if you've picked up on that), and rather than a single letter or a symbol, it just straight up says DREDD. Full name. Right on it. Amazing. And then there's the chain that connects it to the zipper, which is always pulled up. And then there's the glove pouches. And the kneepads. And the knuckledusters. And the helmet. It doesn't stop. And what's really bananas about it is that it's a uniform. Multiple characters wear this same outfit, sometimes a dozen at once in a single panel, which I have to imagine is why British comic book artists are driven to drink. They have to draw every single part of this costume over and over again, and you can't really skimp on it because it's perfect. Back at Emerald City, I picked up a copy of Complete Case Files v.5, which is the book Mega City Two writer Douglas Wolk suggested as a good entry point for new readers. On a whim, I thought it would be fun to pass it around to people like it was a yearbook, and I got a bunch of folks to sign it, and a few even decided to try drawing Dredd himself. The thing I learned from that experience was that Dredd's so complicated that you can't even do a quick head sketch without taking some time to figure out how all the details on that weird helmet of his works. If you try, you just sort of end up with Magneto. That grumpy little line set on that chin is the real trademark for Dredd, the thing that pulls it all together and finally tells you pretty much everything about the person you're dealing with. He is in this overwhelming future, and he is not happy about it. The other great thing about Dredd's uniform is that, even with as complicated as it is, it's the baseline. It's the standard model, and Dredd's world is full of modifications on that basic theme, whether it's the Judges of other cities or just different specialists from his own Department of Justice. And those only work because they're playing off of Dredd's. It has, strangely enough, proven to be one of the most adaptable costumes in comics, even if the adaptation is just dropping an even more gigantic golden eagle on it for the Chief Judge. They're all just variations on the same thing, but twisted around (and set on fire) to form Halloween costume reflections of the standard suit, and they're all fantastic. 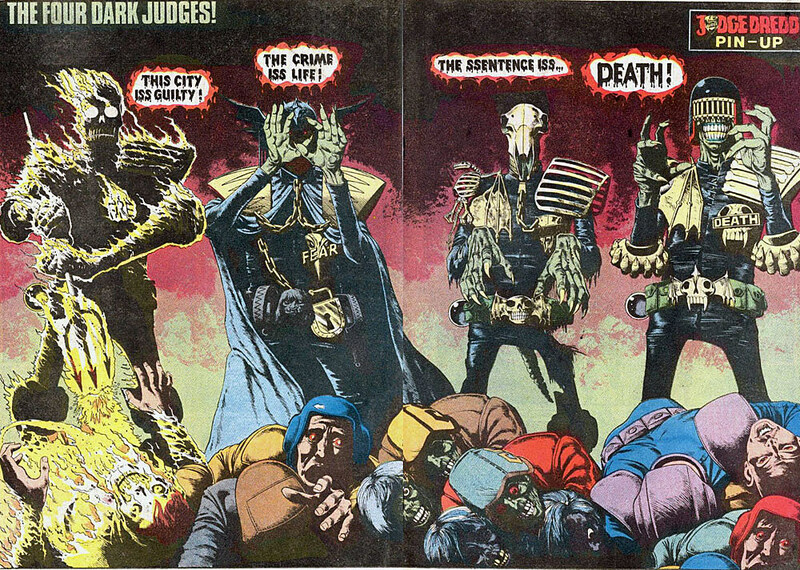 Judge Fear's suit is a favorite, with the ominous belt of traps, shrunken heads and locks connected to the chain on his badge, but Judge Death is a point-by-point, note-perfect counterpoint to Dredd's. Like Dredd's, it's one of those costumes where there's just more to it the longer you look, from the Eagle being replaced by some bat-winged horror, which also frames the skull on his belt, the stitching taking the place of the zipper and chain, the bones on his shoulder pad, the claws on his elbows, the cemetery-gate portcullis on his helmet... It's awesome. And it's all just built as a response to that original costume. It holds up to modification even when you make it more complicated than it already was. It's worth noting that the 1995 Judge Dredd movie, while basically terrible, was almost 100% faithful when it came to costume design. The only thing they really changed was the addition of an oversized metal codpiece, and really, once you see the rest of the costume, why not? The Karl Urban film, however, which is fantastic, was clearly shooting for a more "realistic" take by darkening the colors and converting the excessive details into more functional body armor. Under normal circumstances, that's a recipe for disaster (see also: Daredevil), but for Dredd, it worked, because they kept all the elements intact. The Eagle is still there and still massive, but it's on a piece of armor now. The badge is still massive and still has his name in huge letters, and while it lacks the chain up to the zipper, they kept the belt buckle, of all things, 100% accurate. That bonkers helmet is completely there, too, and Urban never takes it off. He lets that scowl do the talking. Like the original suit, it reflects and emphasizes the underlying theme of the movie's Mega City One: It's still over-the-top, but it's also highly militarized. If those gloves and boots had been green, they would've been perfect. ...well how the hell else are you going to dress?